Pixar Fest is coming to Disneyland and California Adventure theme parks April 13, 2018 and will run through September 3rd. 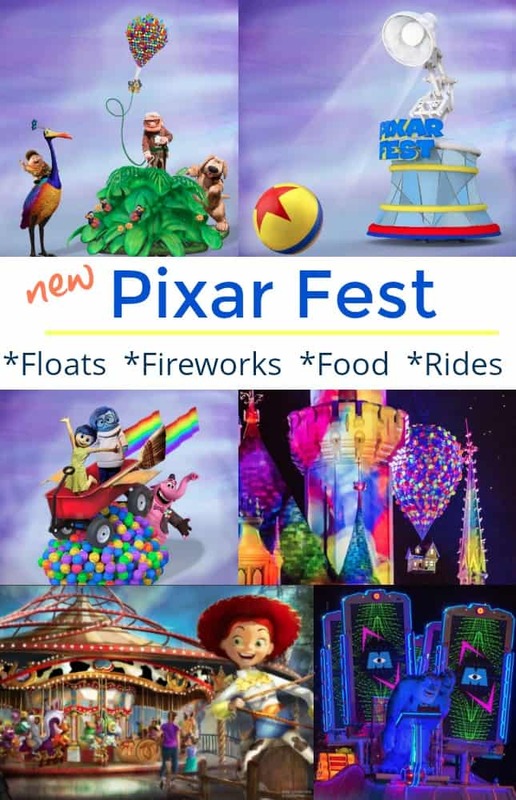 This is a HUGE Pixar themed celebration kicking off the opening of their new Pixar Pier (Pixar Pier opens June 23rd) along with brand new Pixar character floats, fireworks show, restaurants, food and MORE! It will be a summer to remember! If you want to know more about the Abominable Adorable Snowman Treats and Alien Macaroons (and other Pixar food hot spots) check out our Pixar Pier Food Post here. Scroll below for some of the brand new features! This year the theme is all about Friendship. From Jesse and Woody to the Incredibles family – Pixar has made movies for everyone – not just the kids! 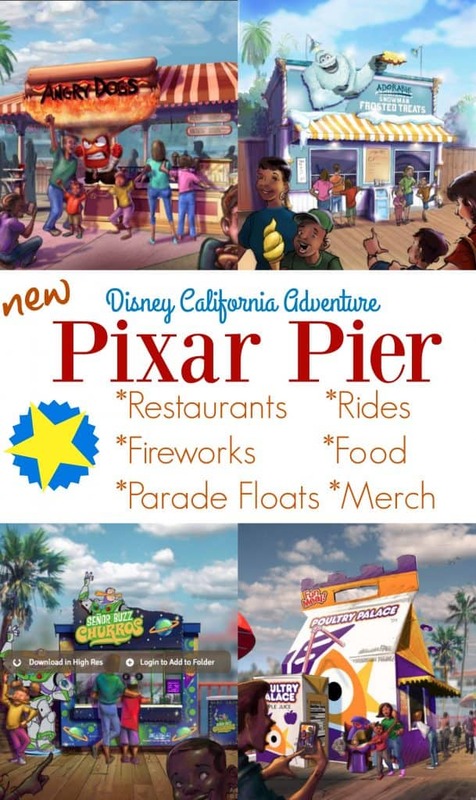 I can hardly wait to drive out to California next summer to enjoy everything at Pixar Pier with my family! Inside Out: Joining the parade is Joy and Sadness on flight aboard Bing Bong’s rocket wagon! Incredibles Float: This high energy float will be showcased in the “Paint the Night” parade at Disney California Adventure Park. You can get a glimpse of the new superhero Underminer, as well as Mr. Incredible, Elastigirl, and a favorite of ours – Frozone! PLUS see Violet, Dash and Jack-Jack’s unique powers with elements like LED lights, pop-art effects and more! Up Float – Up is one of my (many) favorite Disney Pixar films and I’m super pumped there is a float for all my favorite characters! You’ll see Wilderness Explorer Russell, Kevin, Carl Fredricksen and Dug! Sulley – You can’t have a Pixar parade with your favorite Monsters, Inc. friends! This special float features synchronized LED costumers inspired by the iconic Main Street Electrical Parade. The “Paint the Night” parade features more than 1.5 million LED lights! Jessie – And where would we be if we didn’t have our Toy Story friends in the parade? One of my favorite feature of any Disney Theme Park is their insanely awesome fireworks show. They have a new Pixar themed fireworks show, “A Pixar Nighttime Spectacular”, which features your favorite characters from Cars, Toy Story, Wall E, Coco and of course, the Incredibles over Disneyland Park! The fireworks show can best be seen on Main Street and is projected onto the castle, the water screens of the Rivers of America, the facade of “It’s a Small World” AND the buildings of Main Street, U.S.A.! WOW!! The overall theme? Friendship! Incredicoaster – inspired by none other than Disney Pixar’s The Incredibles! You’ll also walk through a nearby mid-century modern style area! Check out the visual video above! Check out this amazing Walt Disney Imagineering sculpted maquette of one of the critters from Jessie’s Critter Carousel! For more amazing new Disney Pixar Fest food items check out our blog post dedicated to the new Pixar food!